Black Star Fishing Co. - Blackstar fishes for salmon and steelhead on the greatest rivers in the Northwest. In the spring and summer fish I the Lewis, Kalama, and Cowlitz. During the fall and winter you'll find me on the Wynoochie, Humptulips, and Skagit. Come spend a day on the river using top-of-the-line gear, aboard a comfortable boat being led by a friendly, knowledgeable guide who will ensure a great day of fishing. Website: Black Star Fishing Co. Caught this 14lb chinook on the westside of Cypress. 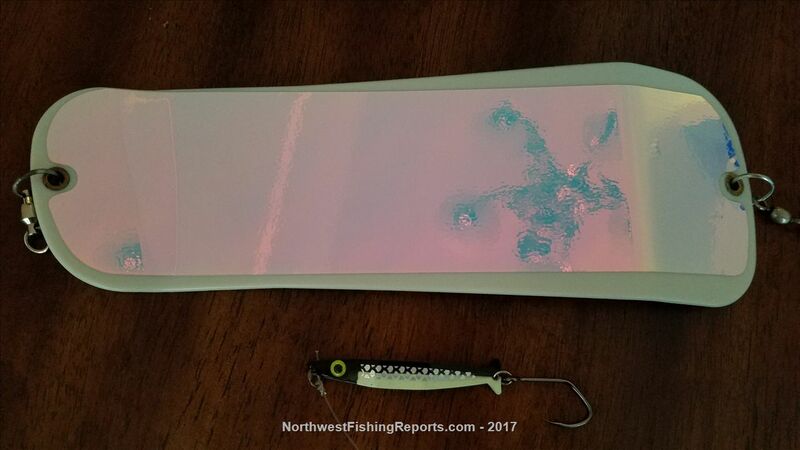 Trolled Luhr Jensen white uv/glow flashers and coho killers in herring aide and the two face cookies and cream colors. 100ft of wire out in 150 feet of water. Not a whole lot of bait and most marks were deep around 100-120 deep. View other reports from scraig1962.